I signed up for this race a few months ago because it seemed like a good weekend to run – with Boston also happening, I knew I wanted to get in some non-road-race mileage in a slightly logistically easier way. This race seemed like a good option. The race started at the uncomfortably early hour of 5am. Even though it would reach >70*F that day, it was cold in the morning, and we huddled around fire pits in the darkness before the race started. This was a larger 50-mile field, with about 300 runners. Because we’d immediately clog the single-track dirt trail, we started in three waves, each a minute apart. They’d slotted me to start in wave 3 – I don’t know how they assigned these – but I snuck up to wave 2, which was a good plan; there was a significant amount of non-passable trail that we had to navigate in the dark, so it was nice to get a decent pace going at the beginning. The first mile was around a very wet and muddy field. Given that this course was actually 50.9 miles, I’m convinced the race organizers just added this part in with sadistic intentions – we were wet and muddy, with shoes thoroughly soaked through, within five minutes of starting. They’d also set up a photographer at the biggest of these mud puddles, reinforcing my interpretation of these early tortuous motivations. When the sun started to come up, it illuminated a gorgeous, lush forest, bordered on one side by the rushing Potomac River. We continued to dance along single-track trail, still energetic with early-race adrenaline, as mist wove between the trees and settled over fields of tall green grass. Bright blue flowers hung from knee-high stalks all around us, carpeting the forest floor. It was quite the contrast with Philly, and that made it so much more spectacular. The first 13ish miles were hilly, but not excessively so. I walked the steeper parts and took it easy on the less steep parts, speeding up on the downhills and flats to conserve energy. After a few hours, we entered Great Falls Park, which looks like this photo below. It was a great start to a beautiful race. 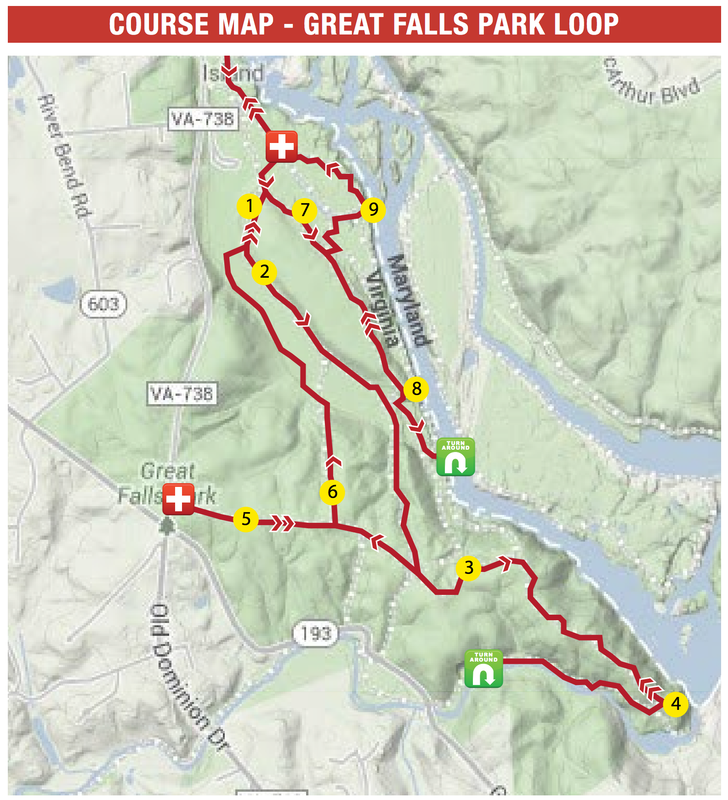 The next part of the race would involve running the most convoluted 7-mile loop three times. See below for the illustrative map, which was intended to be helpful. Map of the 7-mile Great Falls Loop. We started at the end of the first leg, then ran long a wider path for a bit, which had a slight uphill. We turned onto some single track, did an out-and back to a turnaround where someone marked our bib, then came back to the wide path. We crossed that, did another out-and-back to an aid-station, then took a side path back to the main, wider path, and headed back towards the start of the loop … only to take a sharp right, down to another out-and-back, then come partway back but take another detour to the start of the loop. Then do that two more times. Honestly, even though I’ve done it three times, I don’t think I could retrace my steps if I went back today. That’s how confusing it was. The map is still not clear to me. Look how pretty the park was! The first loop was exciting, because we hadn’t done it before. By the 2nd loop, the 50k racers joined us, which was fun – they were pretty energetic, and many of them were excellent cheer captains. I paused at the mid-way aid station to take off my socks and shake the rocks out of my shoes – it was a great feeling to get the grit out, and I felt rejuvenated to knock off the third lap. Third lap … tired of running … let’s try something different! Passing through the end of the last loop, having run about 35 miles, I felt ready to take on the remaining ~15 miles of the race. That feeling quickly faded … when I realized I still had to take on another 15 miles. Food seemed undesirable – not that there was anything wrong with the aid station options, which were great – my stomach just didn’t seem keen on any of it. I was mostly subsisting on Mountain Dew and water, and maybe a Gu if I could force one down. The first four miles to the next aid station were challenging because they were flat, so there was no excuse to walk. At this point, it hurt to do anything – walk, run, or sit down – but the fastest way to the finish line was running, so I kept moving at a slow trot. The remaining ten miles were very warm and humid, and seemed to take a very long time. Even though I was hurting, I seemed to be doing okay – I was passing some of the slower marathoners and 50k runners, and several 50-mile runners as well. Most frustratingly, the trail was completely perfect for running – soft, mostly flat single-track, pretty easy to navigate – which meant there were no excuses to walk. At least with hilly courses you get an externally-imposed walk-break. I found myself longing for the vertical ascents characteristic of West Coast races. That is, until we hit the final hilly section. Then I immediately hated the hills – they’re hard to climb! – and yearned for the flat trails I’d been on just moments before. The last few miles were pretty rough. At one point, we reached an aid station where all the shorter distance runners went straight for another mile or so to the finish, but we had to take a sharp right and do a two-mile out-and-back – that was pretty disheartening, because the finish line was right there! Seriously … I can basically see the finish line. 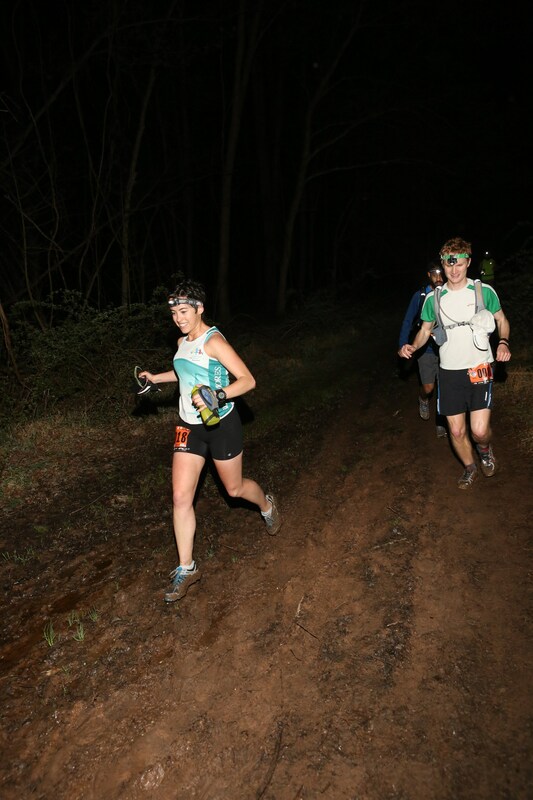 I fell into pace with a younger runner – Naval Academy student doing his first 50-miler. We picked up the pace and were doing 9ish-minute-miles for about two or three miles during this out-and-back, which is really fast for the end of a long race! He dropped back at one point with just a mile to go. Feeling strong, I pushed hard to the finish. 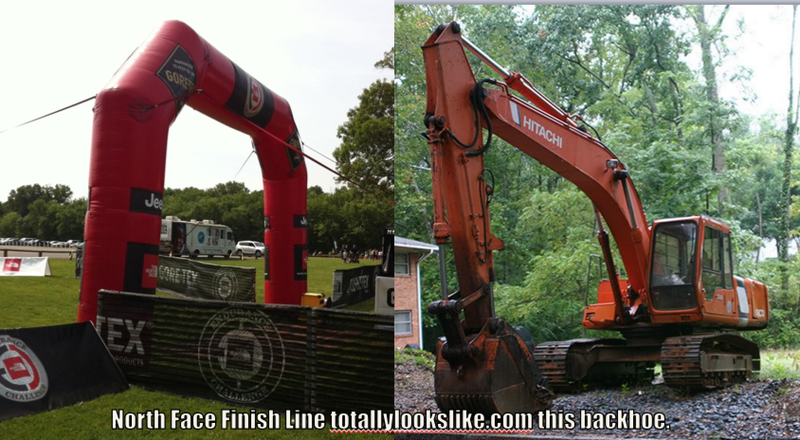 At one point, I thought I saw the finish-line – it looks like a big red arch. Turned out I just saw a red back-hoe. Disappointing. Just a few minutes later, I saw the actual finish-line. And crossing it was great. I had some enthusiastic friends – fellow Wharton students, running the 13.1 the next day – waiting at the finish line, and it was so fun to see them. Crossing the finish line with #mywharton girls! Overall, it was a pretty great race. Tough towards the end – but what 50-miler isn’t? – yet I’m proud of my performance. I came in 3rd for my age group, and in the top quarter overall [including men!] which is pretty good. My final finish time was 10:28, which isn’t my fasted 50-miler, but isn’t bad considering the hills. North Face is a pretty commercial ultra series, which means there are a lot of new or first-time runners. It’s always great to indoctrinate newbies into the sport. However, it also means that the spirit of the ultra community isn’t as present at these sorts of races – there’s a sort of camaraderie on the trails that arises from having done a lot of these. It’s an understanding that we’re all out here together, and a great way to get through the pain is to rely on each other for conversation, pacing, and support. North Face didn’t – doesn’t – really have that vibe. But being down there with friends, who would be running the next day, more than made up for it. 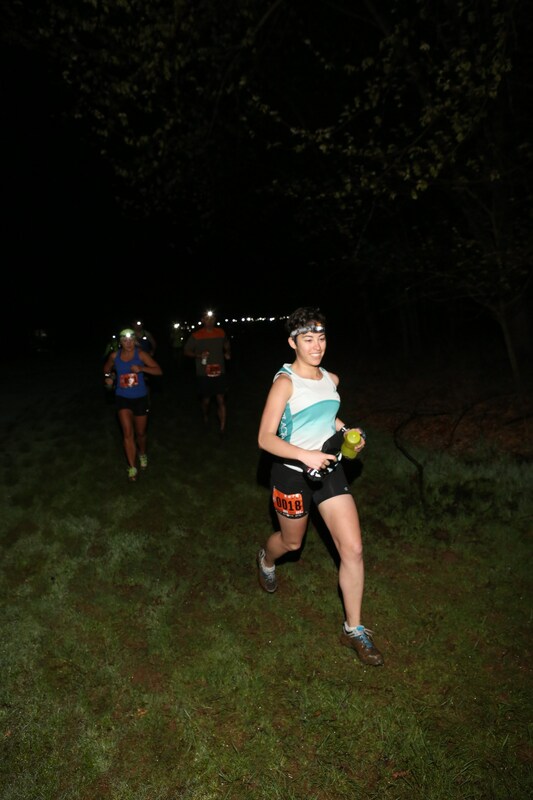 This entry was tagged 50m, elevation, finishing, fuel, hills, no excuses, nutrition, race, race report, running, ultramarathon, Virginia. Bookmark the permalink.